It’s here. Dyuralya Square, the new park and community meeting place, right opposite The Finery in Waterloo, celebrated its official opening on Saturday 30th March 2019. 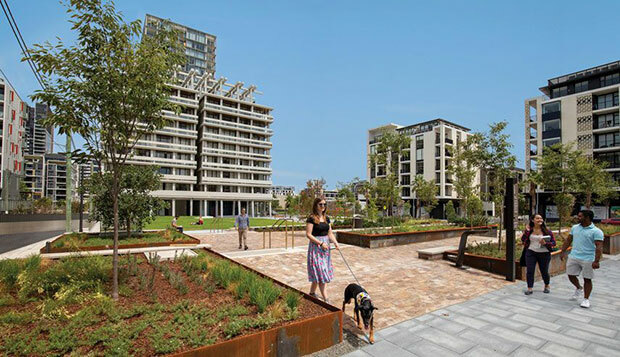 With garden terraces, a paved courtyard, dozens of new trees and seating, the Square is a fantastic green sanctuary for locals and of course our residents at The Finery. It’s a great chance to visit and see all the changes that have been happening in this corner of Waterloo. Construction of The Finery is complete, the boutique retail and dining spaces are filling up and you can now walk, cycle or drive all the way down Gadigal Avenue to East Village. For more information on The Finery visit – thefinery.mirvac.com.